Moses Mags are made with great pride in the USA by Americans and is marked accordingly. It counts for 3 of the required US made parts for 922r. 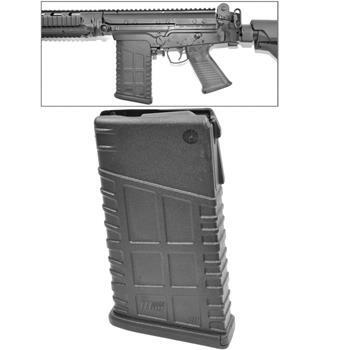 This magazine is for 7.62x51/ .308 FAL type rifles and any rifles that utilize this pattern magazine. This magazine fits all Metric & Inch pattern FAL rifles. Tooless disassembly for quick cleaning and inspection. Reinforcement ribs for enhanced strength and positive control in all environments. Flared floorplate aids handling while providing added drop protection. These magazines may require hand fitting to your rifle/ receiver. This may include filing at the beak on the face of the magazine as well as the rear locking lug where the magazine catch engages. Please contact the manufacturer for additional details.